Samsung has launched a website promising to wipe your favorite TV series from your memory so you can watch it again seemingly for the first time. The creepy concept, known as Unspoil me, was apparently launched in January and is available through the company's Swedish site. The technique was developed by certified hypnotists Ulf SandstrÃ¶m and Frederik Praesto, who narrates the video. The 23-minute procedure is a guided hypnosis which tells you to focus on the show you want to erase from your memory, as it shows a hypnotic pattern and walks you through a series of instructions. The process is billed as a way to experience all of your favorite shows for the first time using Samsungâ€™s QLED TV. With the Samsung QLED TV we want to offer you an amazing binge-watching experience; with a wide range of content and remarkable picture quality," the website states. "There's really only one thing that could ruin your experience - that you already know how everything ends. That is why we created Unspoil me; a tool that gives you the possibility to forget your favorite TV series, so you can re-experience it with the same thrilling feeling you had the first time you watched it." Victims - ahem - participants, who are required to be over 18-years-old, are advised to watch the entire video "without interruption in order to work." They also recommend a quiet place and headphones, suggesting the operation may also incorporate binaural frequencies. 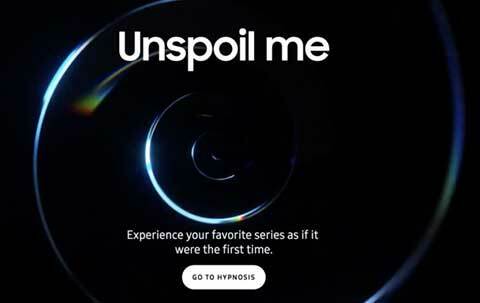 Unspoil me promises to erase only memories of the TV series, movie or video you choose, and claims you can do it as many times as you want for various shows. Movie "Forgotten" Comes to Mind, ET or Deep State?